Our Lakes and Lederhosens road trip around the Italian Lakes and Bavaria, certainly lived up to our expectations. It actually ended up feeling like 3 trips in one. We spent 6 nights around the stunning Lakes of Maggiore & Como, 2 nights enjoying the thrill of a Formula 1 Grand Prix at Monza. Then 5 nights exploring the regions in southern Germany. To try and condense these adventures, I have put together our favourites bits. So, after prepping our car for the 2 weeks ahead we hit the road for foreign shores. The scenery around the lakes is amazing, you can see why people return time and again. The high peaked mountains peering down onto the lakes below makes a stunning backdrop. Touring around the shores of the lakes is great fun, at times you feel like you are on a movie set. 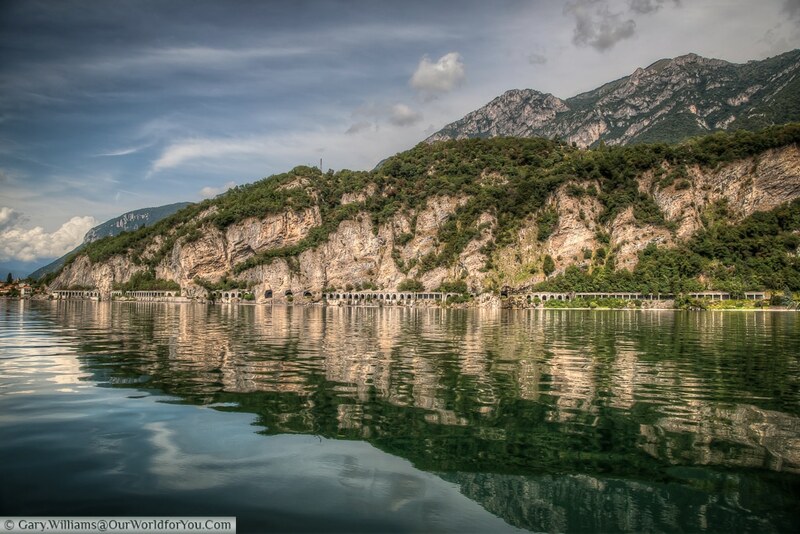 Winding tunnels arched along the banks of the lake and weaving through small towns. 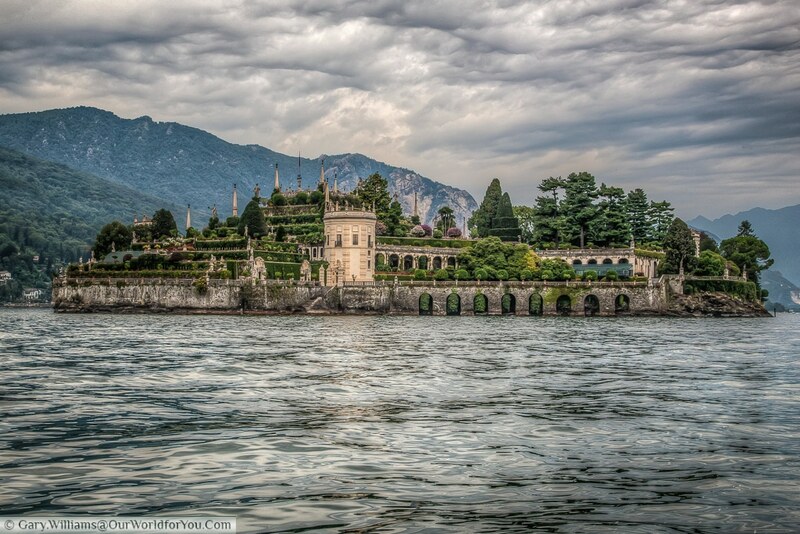 The Borromean Islands just off of Stresa in Lake Maggiore are certainly worth the little boat trip. Isola Bella has fantastic Baroque gardens and even white peacocks. Touring around under your own steam is great fun and you get to see a lot more of the country. Whilst driving through the alpine countryside of Germany, Austria and particularly Switzerland you can hear the clanging bells around the necks of the cows, on the surrounding pastures. If you are in Bavaria spend a day visiting the magical fairy-tale castles of Neuschwanstein & Hohenschwangau just outside Füssen, Germany. 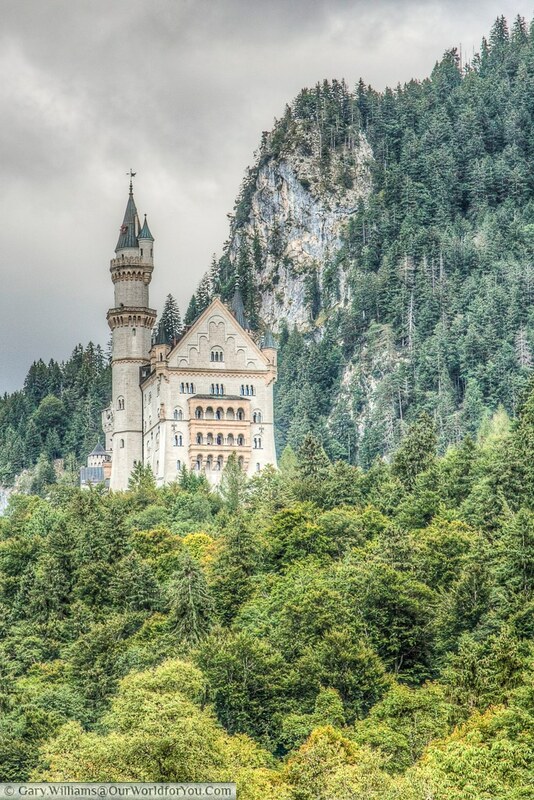 You may recognise King Ludwig II’s Neuschwanstein from the film Chitty Chitty Bang Bang. 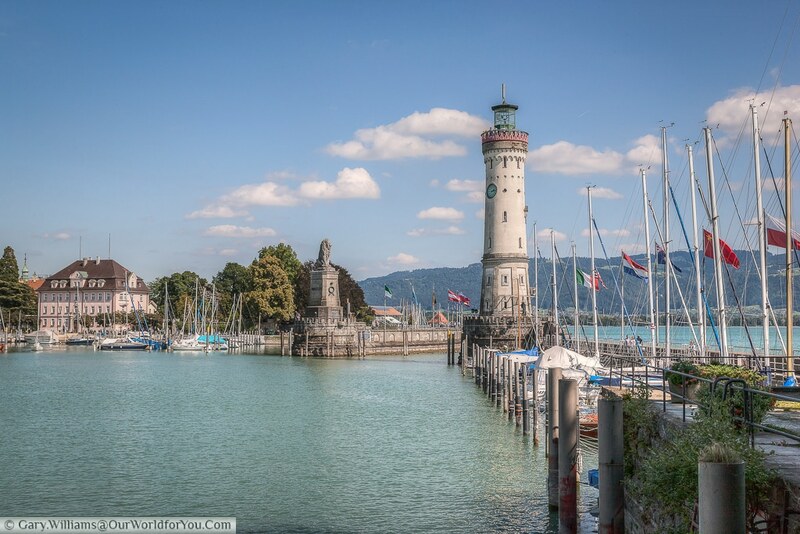 Whilst based in Füssen we spent a day out and about touring and visited Lindau which is on the banks of Lake Constance (or Bodensee in German). Another amazing lake and this one borders 3 countries Germany, Austria and Switzerland. Very popular for water sports. 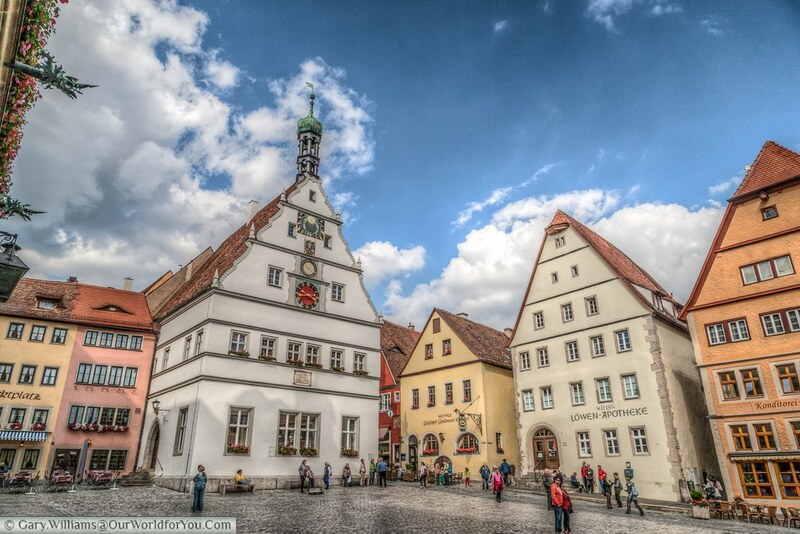 Another highlight of the trip was picking up sections of the “Romantic Road” through Germany, this route takes you through some stunning towns and villages. One of which we revisited at Christmas 2016 and that is Rothenburg ob der Tauber. One of the great pleasure of the trip was going to the F1 Grand Prix at Monza. The Italians really know how to celebrate and Ferrari only came 2nd. 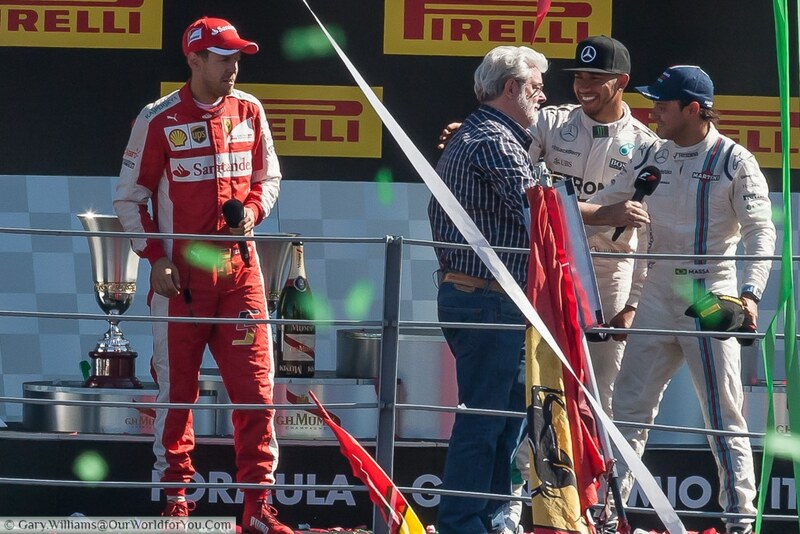 Our fellow countryman Lewis Hamilton won and was presented the trophy by George Lucas (no less). This is probably a weird pleasure, but one of our evenings in Menaggio a huge thunderstorm broke out and we had a view from our hotel room of lightning striking across the mountains and lighting up Lake Como. As this was 2 week trip we didn’t have time to stay at Lake Garda, but we drove along its shorelines from Monza on the way to Füssen. We will certainly add Garda to the itinerary for next time. Sipping Aperol spritz overlooking Lake Como. 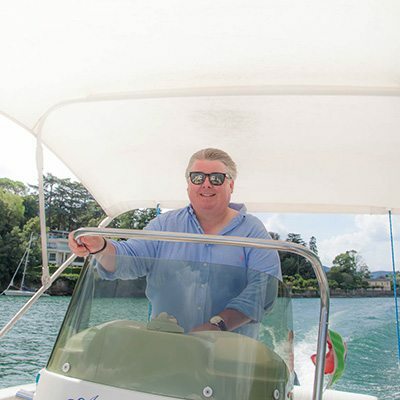 One of our abiding memories of this trip, was the day Gary and I hired a motor boat and spent 6 hours cruising Lake Como. It really was fantastic, you get a different perspective of the lake and also the chance to see some of the amazing palatial villas that border it (I didn’t see George Clooney). As it was Gary’s birthday, we did stop the engine & pop a bottle of Prosecco open. 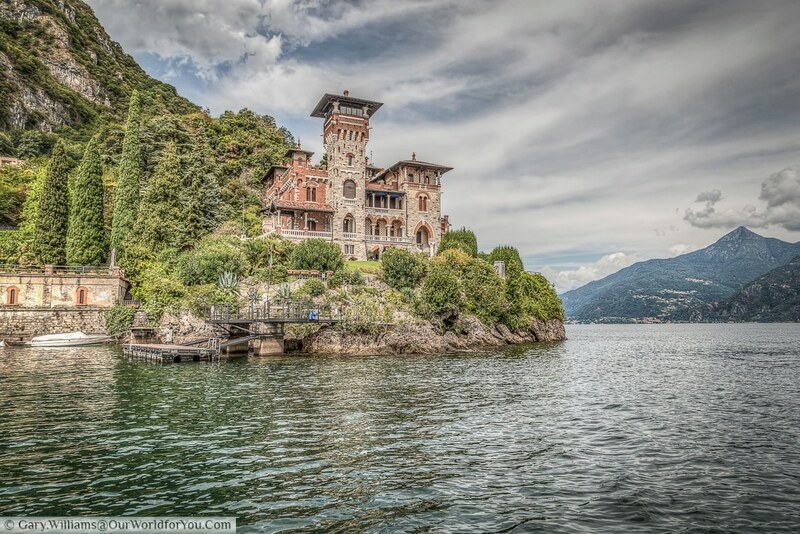 Whilst out and about on Lake Como we spotted a couple of James Bond’s filming locations from Casino Royale, this was beginning to feel like an Ian Fleming tour. 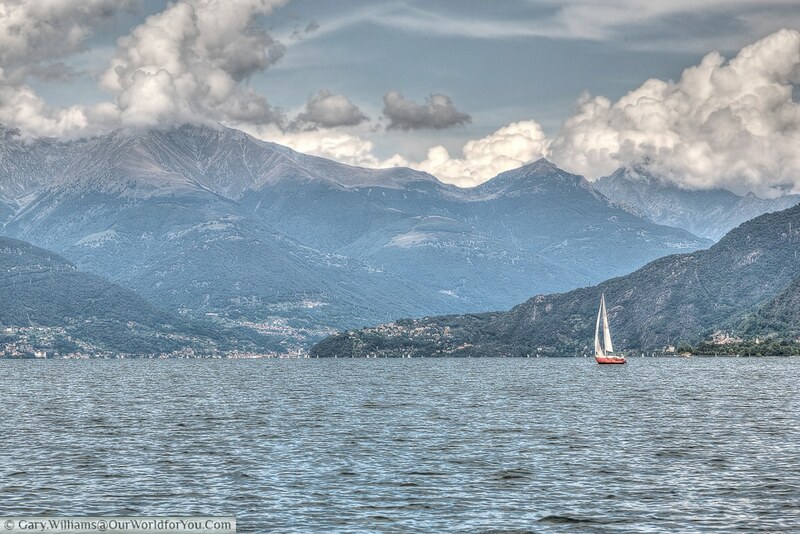 In Stresa we stayed at the luxury Regina Palace Hotel, our room was lovely but the balcony and lake view, was amazing. One night as we returned, the ornate front terrace was awash with elegant local couples, tangoing the night away to sultry Argentine melodies. That memory will always remain. The night of the seductive couples performing the Argentine tango, I am 99% sure I spotted Sean Connery tucked away in a dark corner. Unfortunately, Gary could not corroborate this, but I am a bit of a fan of Sean’s, and I’m positive it was him trying to be inconspicuous. Our very brief passing through Austria was not enough, we will certainly return one day and visit this country in greater depth. Having to buy an annual vignette to travel through Switzerland for just one day. At CHF40 ($40/€37/£32) it’s an expense you could really do without, but those alpine passes are amazing. In Germany don’t forget they have autobahn’s, you may see an Audi looming up in your rear-view mirror. If you do visit the Borromean Islands in Lake Maggiore, try to set off early. As the boats, out to these islands can become very busy. Like in Switzerland, if you wish to use the motorways in Austria, you need to purchase a vignette. Fortunately, you can pick these up quite easily at a petrol station and obtain one for a 10 day period at €8.80 (check current price). We really enjoyed our Lakes and Lederhosens road trip, and will definitely venture back to this region of the world again someday. If you get the opportunity to visit Milan and are able to add a few days onto your trip. We would highly recommend you hire a car, and take a tour around the lakes, you won’t be disappointed. Toured the lakes? what’s you favourite, and do you have an secrets you’re willing to share? 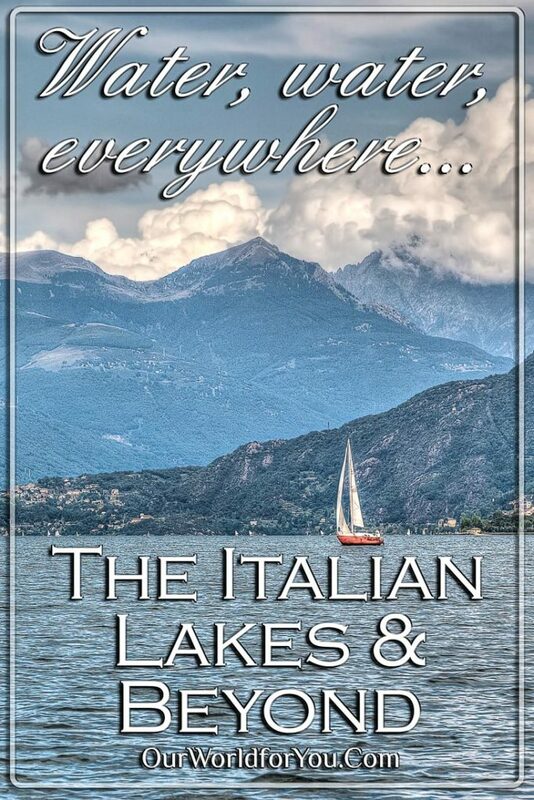 Inspired to visit the Italian Lakes? To plan your own road trip? The beauty of a Champagne road trip.